American filmmaker George Lucas created some of the most profitable movies in history, including the Star Wars and Indiana Jones films. Lucas is also responsible for many new developments in filmmaking, especially involving special effects. George Walton Lucas Jr. was born in Modesto, California, on May 14, 1944, the only son among George and Dorothy Lucas's four children. His father sold office supplies and equipment and owned a walnut farm. Lucas was not a good student; he enjoyed racing cars and owned a souped-up, high-powered Fiat (a brand of Italian automobile) in high school. Shortly before graduating he was involved in a serious car accident, nearly dying from his injuries. After recovering from a three-month hospital stay, Lucas decided that he wanted to go to art school. His parents refused to pay for it, so he instead enrolled at Modesto Junior College to study social sciences. Lucas became interested in photography and film and began making films with a small camera. While photographing a car race he met Haskell Wexler (1922–), a famous cinematographer (motion picture cameraman), who helped him get into the University of Southern California (USC) film school. Lucas produced eight student films, including THX-1138: 4EB (1965), in which he explored his vision of the future. After graduating Lucas worked as a cameraman (he filmed part of the famous 1968 Rolling Stones concert in Altamont, California, in which a man was stabbed to death) and as an editor for films produced by the United States Information Agency. While at this job he met Marcia Griffin, a film editor. They married in 1969 and adopted a child in 1981. The couple divorced in 1984, and Lucas later adopted two children on his own. In 1969 Lucas won a scholarship from Warner Brothers Studios, which allowed him on the set to watch the filming of Finian's Rainbow, which was being directed by Francis Ford Coppola (1939–). Lucas and Coppola became friends, and Lucas helped edit the film. Lucas also worked on Coppola's next film, The Rain People. Through Coppola's newly created film studio and production company, American Zoetrope, Lucas made his first feature, THX—1138, based on the short film he made as a student. In 1973 Lucas experienced his first real film success with American Graffiti, which focused on one summer night in 1962, following teenage boys and their cars. Lucas co-wrote the script and directed it, with Coppola serving as a co-producer. American Graffiti was filmed in less than a month for a little over $750,000. Although Universal, the studio that had paid for the production, did not believe American Graffiti would make a profit, by several months after its release it had become the surprise hit of the year. It was one of the most profitable films of the 1970s and was nominated (put forward for consideration) for five Academy Awards. Lucas next began working on the script for an original space story, Star Wars. He planned the story as a series of three related trilogies (series of three works); Star Wars was the first episode of the middle trilogy. The film included elements of westerns, soap operas, and other types of films as well. The Lucas-directed Star Wars was released in May 1977. It received very positive reviews. His very personal vision also appealed to a mass audience. The film smashed all box office records, and many people went to see it more than once. Star Wars earned $400 million worldwide in its first release. 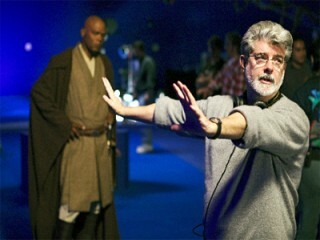 The experience of making the film, though, left Lucas exhausted, and he did not direct another film for twenty years. He had made a wise decision to turn down a director's fee (money that a director receives for making a film) for his work on the film in exchange for rights to merchandising (the ability to make money from products, such as toys, related to the movie). He also retained the rights to the Star Wars sequels (follow—up films). Lucas made $500 million between 1977 and 1980 from the sale of Star Wars merchandise, including books, toys, kits, and consumer items. He managed the merchandising through his company, LucasFilm Ltd., which was established in 1979. Lucas set up other companies to manage his film empire. In 1980 the second film in Lucas's trilogy, The Empire Strikes Back, was released. Lucas was the executive producer (one who pays for the release of a movie) and wrote the story on which the script was based. Although some criticized the story, many noted that the special effects were better. Lucas returned to a more active role in 1983's The Return of the Jedi. He co-wrote the script and again served as executive producer. While the special effects were excellent, critics thought they took attention away from the characters and the story. Still, all three films together brought in $1 billion. Sales of official merchandise brought in over $3 billion. At the time Lucas began developing Star Wars, he had an idea for another series of films. The Indiana Jones series was developed as a tribute to adventure films of the 1940s. Lucas wrote the story and served as producer for the first Indiana Jones movie, entitled Raiders of the Lost Ark. His story again pleased both critics and audiences. Lucas was less involved in the next two Indiana Jones movies, Indiana Jones and the Temple of Doom and Indiana Jones and the Last Crusade. In 1992 he produced a television series, The Young Indiana Jones Chronicles, which lasted for only one season. Throughout the 1980s and most of the 1990s Lucas worked mainly as a producer. Movies such as Howard the Duck (1986) and Radioland Murders (1994) were failures; others, such as Tucker: The Man and His Dream (1988) and Willow (1988), were more successful. Lucas, with profits from his films and LucasFilm, Ltd., founded Skywalker Ranch, a production house (a place where a movie is edited for theatrical release) in California. Lucas based all of his companies there; one in particular changed the face of the film industry. Originally created to handle the special effects for Star Wars, Industrial Light and Magic (ILM) improved film technology (applied science) through research and development. ILM branched out to do special effects for other movies, such as Star Trek and E.T: The Extra-Terrestrial. ILM was also responsible for THX, an improved sound system found in many movie theaters. Though many doubted the other two Star Wars trilogies would ever be made, in 1994 Lucas began writing the scripts for the first trilogy. To prepare audiences, "special edition" versions of the original Star Wars trilogy were released in theaters beginning in 1997. Using effects developed by his companies, Lucas fixed some of the errors in the first films and included new scenes, adding four and a half minutes to Star Wars. In May 1999 Lucas released The Phantom Menace, the first installment of the first Star Wars trilogy. Lucas directed the film and wrote the script. In December 2001 Lucas donated several items used in the Star Wars films to the online auction firm eBay to raise money for relatives of the victims of the September 11, 2001, terrorist attacks on the United States. In 2002 the next Star Wars film, Attack of the Clones, was released. View the full website biography of George Lucas.